Hi, my name is Chris Roth. I’m the creator of the Visio Guy website and forum. It is fun being the Visio Guy, but I am happy to explore new opportunities. 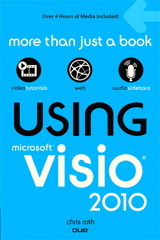 If you’ve poked around visguy.com or the forum, you know that Visio Guy helps thousands of people with informative articles and quality answers to users’ questions. It is very satisfying to serve so many people, and it is great to have an outlet for my creativity, and a venue for continually improving my illustration, writing and speaking skills. It’s a great place to keep both brain hemispheres in tip-top shape! I have twenty years’ experience in the software industry as a programmer, evangelist, presenter, writer, author and teacher. All built on very early interests in drawing, math and science, and a degree in Mechanical Engineering from the University of Washington. If your company is looking for good people, I would love to talk with you about using my talents for interesting work with fantastic people. Perhaps we can be of benefit to each other! It’s good to challenge yourself and nice to be appreciated! Application Engineer – Data Assist e.K. Musician – I actively participate in the ESME Orchestra and Big Band as a trombonist. As a performing musician, one is always preparing for the next big show, listening to others, and working as part of one big team. World Trip – We spent 2007 traveling in the U.S., New Zealand, Australia, Hong Kong and Austria.